On Sunday morning I had planned to participate in the Tour de Guilford bicycle ride around Greensboro, with lengths of up to 60 miles offered. Unfortunately, since our hotel checkout was 11 am, I felt that going for a long ride in the North Carolina heat, followed by a visit to a bike show and then finished up with a six hour drive back to Washington without a shower was singularly unappealing to me, let alone to my passenger Jeff, so no ride. Instead we had a leisurely breakfast at the K&W–$5.09 this time!–and went to the local recreation center to enjoy the bike show and swap meet. The parking lot was already well patronized by the time we arrived. After a brief hike past the tennis courts we looked at the marquee set up by Cycles de Oro and featuring a new Specialized S-Works Tarmac SL with those great-looking Roval wheels. The latest, and perhaps not in accordance with the spirit of Le Cirque, but as a recent Tarmac owner I was quite entranced anyway. Through the doors of the rec center and we were in Olde Bike Heaven. We walked around looking at the neat things that people had for sale, ranging from really obscure bicycle parts from the 1950s to frames and complete bicycles in various stages, from pristine to woefully dilapidated. I had made Jeff agree that I was not allowed to buy bicycles of any kind, even a pretty good Bianchi Specialissima needing some nice period Campy parts. So instead of reaching into my wallet, I just kept walking around, taking photos of some great bikes and chatting with people. I met up with Mike Barry, a very quiet person who was taking in all the sights. He was happy to meet a fellow-Canadian and I asked him about his son, Michael, who will not be participating in the Tour de France with T-Mobile as he has come down with a bad case of pneumonia, although it seems to have improved greatly. I told him that I serve my guests the biscotti made from the recipe on Michael’s webpage. We talked about the trip down from Toronto and I mentioned to him the excellent cycling I had found in West Virginia and encouraged him to try Pocahontas County, near the radio telescope in Greenbank, for some really glorious riding. I gave him a copy of my West Virginia roadmap and pointed out the areas where I had been. Since I was clean and neat and not tired out from cycling, Jeff dragooned me into doing a series of interviews for his video blog. I have to admit I had a great time, and meeting the people I have known only by reputation and getting them to talk about their passion was fun for me. Now, these are water bottles! We first spoke with Chris Kulczycki of Velo-Orange in Annapolis, Maryland. A few years ago I bought a set of wooden kayak plans from Chris when he still owned Chesapeake Light Craft and someday I will build one of these but I fear that my building skills will not result in the kind of beautiful “showboat” I dream of. Chris has gone onto other enterprises and now is immersed in the “randonneur” business of cycling, exemplified by the great French touring bicycles produced by Rene Herse, and which is appearing to grow in the United States. These bicycles are built for comfort and durability but are handsome in their own right and ideal for people not obsessed by racing’s fashion dictates. Chris had two bikes on display, and I particularly liked the blue one, with its traditional bottles and 650B tires. I have only read about the latter and never seen one outside the pages of Bicycle Quarterly. Chris has a range of wonderful accessories, including Amish wooden baskets, all-enveloping chainguards and great-looking hammered-out fenders. Next we spent some time with Darrell McCulloch, who had spoken about the meticulous way he builds lugged steel bikes at the seminar on Saturday. He seemed a bit nervous when I began the interview but quickly relaxed and pointed out the features of the bicycle he had brought, which was so beautiful it made my eyes hurt. He had some of the lugs with him that he developed for the sloped-top tube frames and we talked about his customers and their interests. His order book means a 18-24 month wait for a Llewellyn bike but he wanted to sell the bike he brought with him rather than ship it back to Australia. The price for the frame was US$6,000, and built up with full Campagnolo Record it was US$ 10,000. It is clear to me that Mr. Campagnolo is doing a lot better out of this than Mr. McCulloch as the frame took 180 hours to construct before being painted. This works out to US$ 33/hr, including costs of material, amortization of the elaborate tools and all the time put into developing the lugs for what is a rolling piece of sculpture crafted by a true artisan. The service rate at my local Mazda dealership is nearly three times this. Next on our list was Peter Weigle of Lyme, Connecticut, who went to England to apprentice as a framebuilder and eventually opened his own shop in 1977. His current wait list is over five years and looking a the gorgeous dark green frame at his stand I could see why. He talked about his developing interest in randonneur bikes but when he showed us one of his bikes on display in the show area it was clear to me that his heart was still with racing. This lovely white bicycle, with the racing number “13," was a wonderful time capsule of early 1970s cycling. He had built it to race time trials in the UK and it had a single chainring with no front derailleur and a five-speed rear. No aerobars in those days, of course, but the bicycle had Drillium: carefully drilled-out components to save weight. The rear derailleur looked about half the weight it must have been when the Italians made it, and there were holes elsewhere on the bike, including the stem and the chainring and the bottom bracket. He said that he was doing a lot of travelling when he built the bike and he would just take it into his hotel room and bore holes into it with a hand-drill to pass the time. He won the Connecticut state time trial championship on this bike and it was displayed with his jersey and medal. The bike hung around in his shop for years but I for one was enchanted by it and glad he had brought it. The workmanship was superb and the bike, in spite of all the Swiss-cheese-looking parts, was very elegant to look at. Rather than order one of the randonneur frames, I was tempted to see if he would do another “13" for me but then I thought about all that hand drilling. Peter Weigle was also a bit nervous at the start of the interview but his pride in his bicycles was obvious and deserved and he quickly warmed up. A very charming man and very easy to interview. I even got him to talk about his Framesaver product, used to treat the interior of steel frames! On to Richard Sachs, one of the best-known custom framebuilders in the United States. Also located in Connecticut, Richard Sachs, like Peter Weigle, apprenticed with Witcomb Lightweight Cycles in the UK and was building frames at that company’s US operation before he opened his own shop in 1975. Referred to as the Stradivarius of the Bicycle, he builds road frames that are truly exquisite to look at, with their exacting Joe Bell paint finishes and gorgeous lugs. They are apparently wonderful to ride, although I have not had the opportunity to do so. You can expect to wait five years for one. For someone who wanted to go into creative writing, Richard is quite entrepreneurial and in addition to the bicycles he has developed several lines of lugs, the names of which refer to the glorious past: Newvex, Singer-Herse, Nuovo Richie. And he also has his own tubing made to spec by Columbus: PegoRichie. He had an example of one of his frames in an unfinished state and instead of a head tube decal it has a badge formed right into the tube. Richards Sachs is a unique talent, and he has a very entertaining and comprehensive website. Lastly, Jeff and I called on Steven Bilenky and looked at some nicely fillet-welded bikes and he showed us an old Raleigh that he had retrofitted with S&S machine torque couplings, which allow the bike to be taken apart easily. He had a short length of steel tube with a coupling so that he could demonstrate how it worked. And not only could he retrofit it to steel bikes but to titanium frames as well. One more tour of the show area, a few pics of great bikes like the Rivendell with the harlequin handlebar tape pattern and the Hetchins that was used to win the 1956 Tour du St. Laurent (two months after I was born!) 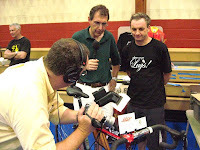 and Jeff and I called Le Cirque du Cyclisme a wrap for 2007. We had an uneventful drive back to Washington and I looked forward to adding all this stuff to my blog. Jeff, on the other hand, will have some issues: each episode of A Billion Bikes is five minutes and he shot a total of 3 ½ hours of video during Le Cirque! It takes patience to wrap two rolls of handlebar tape to look like this! It was a very enjoyable event, with a friendly family atmosphere since everyone seemed to know everyone else and was pretty keen to talk bicycles. I see on E-Bay there are offerings of NOS (New Old Stock) Campagnolo parts and I could even buy a brand new lugged Cinelli Supercorsa frame if I wanted. I appreciate the shape of my Tarmac and the engineering that has gone into it, but you would have a heart of stone not to fall in love with a Vanilla, a Weigle or a Sachs bike. And even though I successfully resisted buying another bike, I did buy a set of four limited-edition postcards of Daniel Rebour technical drawings from Brett Horton so I was not entirely unscathed.